Rudy’s Bar-B-Q raises $43,027.60 for LSF through its Camo Cup for a Cause campaign. 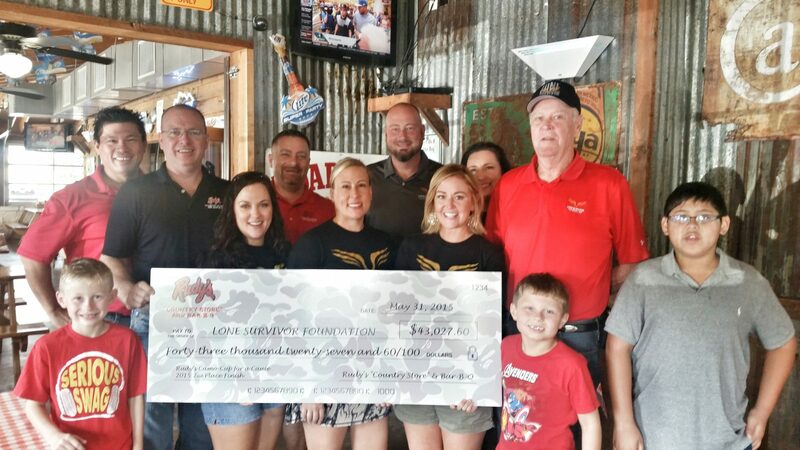 June 26, 2015 – Rudy’s Bar-B-Q invites the Lone Survivor Foundation out for lunch and to present them with a $43,027.60 check for their 2nd place finish in the Camo Cup for a Cause campaign. HOUSTON, TX — (Marketwired) — 07/02/15 — In honor of Independence Day, Rudy’s Bar-B-Q has donated $122,936 to their three military charity partners namely The Chris Kyle Frog Foundation, the Lone Survivor Foundation and the American Widow Project. The financial contribution is the highest amount raised from Rudy’s Bar-B-Q’s Camo Cup for A Cause annual fundraising campaign in May since starting the program in 2013. The funds raised through dollar donations at participating Rudy’s Bar-B-Q locations are divided based on the total votes each charity received from Rudy’s Facebook Fans during the month long voting period with 45% going to the charity with most votes, 35% to 2nd place and 20% to 3rd place. For the second consecutive year, the American Widow Project received the most number of votes from Rudy’s Bar-B-Q Facebook fans and won $55,321.20 for their organization. The Lone Survivor Foundation, which finished 2nd place received $43,027.60 while Chris Kyle Frog Foundation received $24,586.40. Rudy’s Cup for A Cause fundraising program has raised more than $600,000 since its launch in October 2012 with the first Pink Cup for A Cause campaign. Rudy’s Camo Cup for A Cause alone has raised close to $300,000 since its debut in May 2013. Since 1989, Rudy’s “Country Store” and Bar-B-Q has been serving up genuine Texas Bar-B-Q to folks in the Southwest USA. Rudy’s Bar-B-Q pits are 100% wood fired with oak. Along with time and oak, Rudy’s Bar-B-Q cooks with a dry spice that ensures perfectly smoked bar-b-q at every visit. It is best served with Rudy’s famous “Sause.” Rudy’s Bar-B-Q ships meat and sells its famous “Sause,” rubs and merchandise online at https://rudysbbq.com. Like Rudy’s Bar-B-Q on Facebook at https://facebook.com/rudysbbq and follow on Twitter athttps://twitter.com/rudysbbq for the latest updates. This Supplement is Guaranteed to Enhance Your Creative Organ!